For the fifth consecutive time, The Akshaya Patra Foundation has been awarded with the Gold Shield by the Institute of Chartered Accountants of India (ICAI) for Excellence in Financial Reporting for the year 2012-13 under Category XI not-for-profit sector. This victory has also earned the Foundation an entry into the Hall of Fame which is granted to an organisation that has won five consecutive Gold Shields under the same category. Ever since its inception in 1958, the award has granted entry to the Hall of Fame to only two organisations apart from The Akshaya Patra Foundation. Furthermore, Akshaya Patra is the first one to receive this honour in the not-for-profit sector. After a thorough review of accounting practices and financial reporting policies adopted by the participating enterprises, the awardees were shortlisted by a panel of judges from the legal and financial fraternities of India. 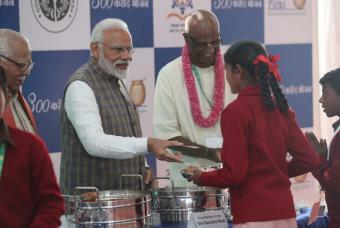 The Akshaya Patra Foundation has a strong hold on quality and hygiene while preparing meals for the 1.3 million children it reaches out to in 9 states and 20 locations across India. Utmost care is taken while preparing the meals to ensure that every meal is nutritious, wholesome and hygienic. In order to ensure the purest quality of food, The Akshaya Patra Foundation operates through two kitchen models— centralised and de-centralised. Centralised kitchens are large kitchen units that are almost a replica of a food factory since they have the capacity to cook up to 1,00,000 meals per day. They are automated so that there is minimal human contact with the food while preparation is in process to ensure hygiene. All the kitchens run by this NGO have adopted various process improvement technologies like Six Sigma and Kaizen. There are two locations, Baran in Rajasthan and Nayagarh in Odisha that run decentralised kitchens. These kitchens are run by Women Self Help Groups (SHGs) under the guidance of Akshaya Patra's kitchen process and operations module. Thus, the funds required to operate these kitchens ensure complete hygiene and quality while maintaining transparency are recounted and updated in the Annual Report of The Akshaya Patra Foundation. Manish Tiwari, Union Minister of State for Information and Broadcasting and Justice G.S. Sistani, Judge, Delhi High Court distributed the award at a function held to felicitate the organisation in New Delhi. The selection committee for the year 2012-13 is chaired by T.S. Vijayan, Chairman, IRDA followed by a 10-member jury, to name a few, M.J. Joseph, Additional Secretary, Government of India, Ministry of Corporate Affairs, Suresh Senapaty CFO and ED, Wipro Limited, B. P. Rao Chairman and Managing Director, BHEL. Based on the degree of compliance with the accounting standards, statutory guidelines and other relevant pronouncements, the Gold Shield, the Silver Shield and the Plaque are awarded for the best, the second best and commendable entries respectively. "The Governance philosophy of The Akshaya Patra Foundation refers to a set of regulations and good practices that enabled us to maintain transparency, accountability and create value for all our stakeholders. We have and we will continue to adhere to the world class accounting standards and norms," said Madhu Pandit Dasa, Chairman, The Akshaya Patra Foundation.